In the previous post I gave an overview of Docker and explained what it takes to run a simple container. In this post I will be demonstrating Docker images which provides the basis for running containers. 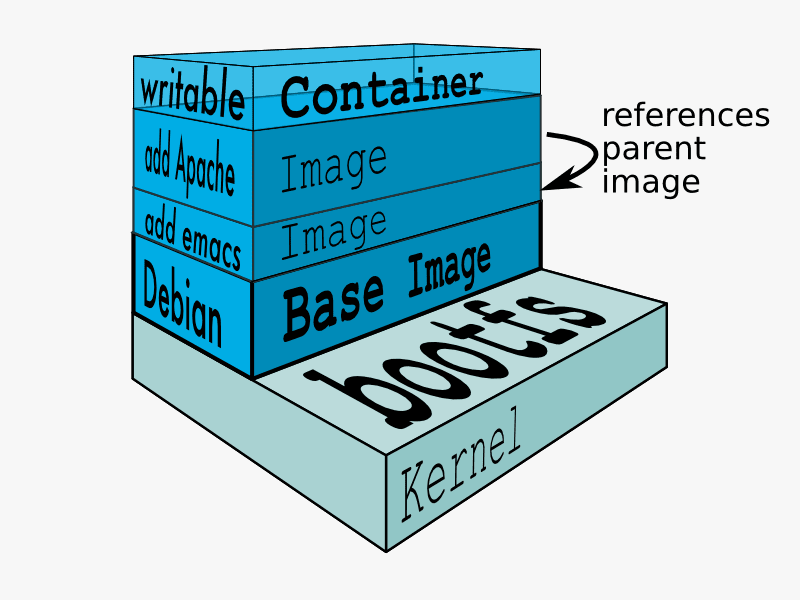 I will go into a bit more detail about what exactly a Docker image is, how to manage your images and also demonstrate how to build an image from scratch and have it store locally on your host. For those of us with familiarity in the virtualization space this might come a bit easier of a concept. A Docker image can be thought of as a template or as source code for all your containers. Docker images provide the building blocks of containers and allow us to define characteristics of containers such as the OS, application and processes running inside the container. Images are what you use to build and launch your containers and is what makes Docker so lightweight and portable. Docker images are what we store in registries that provide us with a git-like functionality of sharing, updating, deploying and storing. There are a few ways of creating images such as by pulling already created images from a repo, creating them from a container or from Dockerfiles. After learning a bit more about images its easy to see how important it is to manage your images. Docker uses public and private registries to help us easily manage our images. We will just be using the local repo on our host for simplicity reasons of this post. This post will demonstrate how to create a custom base image for nginx that you can use to create and run new containers from. This is a way of ensuring that your containers are being created the same and customized to fit your environment and liking. There are a couple of ways doing this. My preferred method is to use Dockerfiles (which will cover in the next tutorial) but for this demo I will be using a custom script written from the Docker Github page (Thanks all you lovely people at Docker!) to build a base image. Another way of course would be to use the "docker pull" command above. Ill demonstrate how to pull down a Centos image, customize it, and then use it to deploy my containers from. Ill be demonstrating using a Centos 6 host and creating a Centos 6 image for running nginx. 1. Go to the Docker Github page and grab the mkimage-yum.sh file . Please be sure to check out the other scripts Docker has provided for other Host OS and other image distributions. 2. Run the script like below. It will take a minute or two to complete. 3. Once it completes we can create a container from that newly created image. We will be attaching to the container, running the customization stuff and then committing the container into an image that we can use later. 4. The above command will attach you to the running container. So just treat this as you would to install and configure nginx on a normal linux server. I used the following steps to complete customizing my nginx environment. NOTE: This is where you would be customizing to fit your environment. GO NUTZ! 5. Logout of the container and check to make sure its exited and no longer running. 6. Now we can "commit" that container into an image. We will then be able to use that image to create all of our "new nginx" servers. 7. To test out the new image, lets run a new container from the image on port 8080 of the host and see if we get a valid website. Go the host IP address on port 8080 in our web browser to validate you get a screen that looks like the one below. If you can see it then you have made it! Hopefully this has given a good overview of Docker images as it is one of the most important aspects of Docker. In the next tutorial Ill demonstrate how to create an image but using a Dockerfile which is my preferred method. This is a continuation of the previous post (Creating Products and Repositories within Katello). This post will show some of the power that Katello provides.The following steps will demonstrate how to create a Host Collection. Host Collections provide the ability to group multiple Content Hosts together based on needs or criteria such as function or environment. 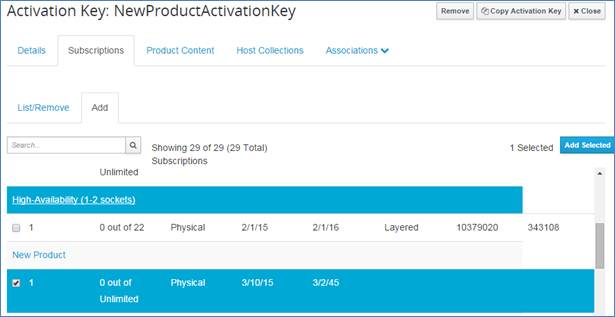 Once a Host Collection is created and Content Hosts are pulled in you are able to run bulk actions against the entire host collection or a selected few. The actions include: Package install, remove and update ; Errata install ; changing Lifecycle or content view (don’t see a whole lot of advantage of the 3rd one, yet). **Before you can take advantage of the Bulk actions, you must install the katello-agent on each content host. The agent will run as goferd service. You will actually need both the pulp and the katello repositories to install it successfully and possibly software collections. I added the Katello and Pulp repos into my product to make life easier and in the event I need to update the agent. See the following links for more information on installing the repos based on your OS. You will see agent install and goferd start. You will then be able to utilize Bulk Actions with Host Collections! 1. Within your desired Organization and Location, create a new Host Collection. 2. Add Content Hosts to the New Host Collection. You should see your Content Host you registered in the previous Demo here. 3. Once you have added your desired Content Hosts to the Host Collection you can now run Collection Actions against the Host Collection. Will demo a package install. NOTE: you can select certain content hosts within the host collection if needed. 4. Uncheck content hosts that you want to bypass if any, type the name of the package and then click Install, Update or Remove. You will be notified when completes. Its that easy! I think this is an extremely powerful and quick way to handle package management across your infrastructure. Although we have things like Puppet or Ansible that also has the abilities to do this in bulk as well, I think that this is still a nice feature to take advantage of. Please note that once you create a new host collection you can now automate the process of adding content hosts to host collections. Go back into your Activation Key you used from the previous tutorial and add the Host Collection to that Activation Key. We will start to dive into automating and provisioning in the upcoming tutorials and piece all of this together so you can have complete automated control over your infrastructure with Foreman, Puppet and Katello. The following article will cover how to create Products and Repositories within the Katello project. There are several components that must be performed ahead of time in order to make repo management simple. Steps below are for creating custom products and does not cover Red Hat repositories. A couple definitions before we begin. 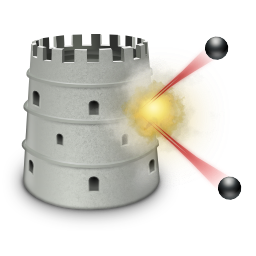 Products - Products are a collection of repositories and content within Katello. This is what you will subscribe your content hosts to in order to access these repositories. Content Hosts - Content Hosts is a fancy way of saying clients. These are the client machines that you are registering to products (using subscription manager) and what consumes the repositories. Katello has the ability to store information about each Content Host and initiate package tasks using the katello-agent which will be covered later. 1) Within your desired Organization and Location, create a new product. As mentioned, a product is a collection of repositories. 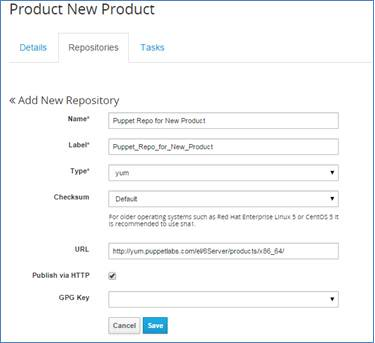 so you will register your hosts to a Product and that will enable you to access repositories within that Product. 2) Fill in the Name and Label and Save it. 3) Once the new product is created, create a new repository. 4) Fill out the form to create a new repository. We will create a Yum repo for this example. Using the Puppet repo since it contains a small number of packages to save disk space. Please note that you can create several different types of Repos within products but I am only demonstrating yum. Save when done. 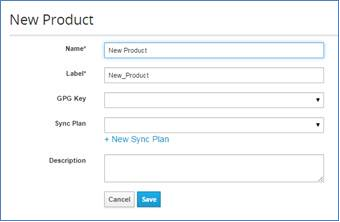 5) Now sync the packages to the Product. 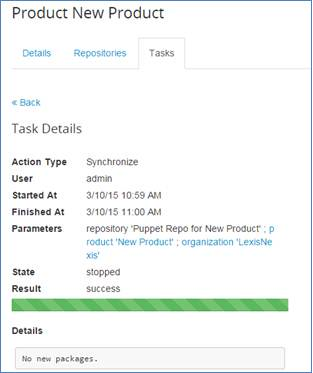 Note that you can setup a scheduled sync plan for the repos. 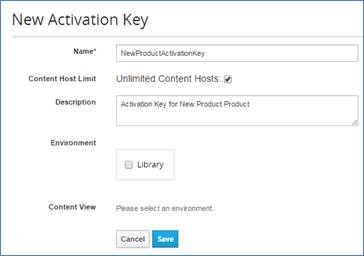 6) Create a new activation key for the newly created product so you can register content hosts without a password. 7) Subscribe the New Product Product to the newly created Activation Key. 8) You can now register content hosts (clients) to the newly created product. Use the following steps to register content hosts to products. The steps are done from the content host itself. B) Install the Katello server CA. C) Register to the Product using the activation Key. 9) You should now see the repository or repositories from the content host. Run “yum repolist” to validate. You will also see the content host populate from the Foreman web UI. You will be able to install anything from the repo using yum on the content host. This documentation only covers the basis for creating products, repositories and registering content hosts to Products. In the next doc I will demonstrate how to manage packages from the Web UI and how to create host collections to run bulk package actions against several hosts at a time. This is where you start to see the power of Katello and package management for your infrastructure.